If you didn't check out my first post in this series about bookish cross stitch (you should do, here is the link for you!) then just to update you, I like to cross stitch. For me, I find it incredibly relaxing to stick on a good audio book and just stitch away. There are so many cute book related cross stitch patterns out there so I have made it my mission to share some of my favourites with you and to try and get as many people cross stitching as possible. The Geeky Stitching Company has been one of my favourite go to places for a couple of years now. They have really cute kits that can be stitched up in a few hours and contain everything you need. I love purchasing these kits for my friends who have never cross stitched before as it's just such a great introduction into the world of cross stitch. 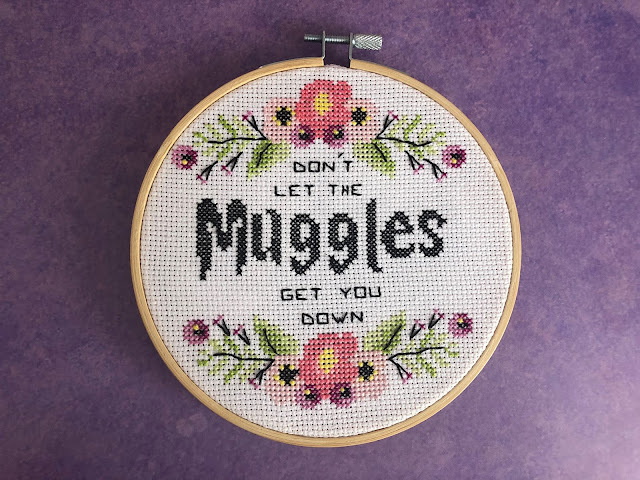 For my blog post today I stitched the Don't Let the Muggles Get You Down kit, which is a quote from Harry Potter. I love this quote and think it looks really cute surrounded by more traditional cross stitch flower designs. There are quite a few Harry Potter kits on the website too, including an adorable Luna Lovegood one that I definitely need to stitch. New patterns come in all the time and they even offer a monthly subscription box. I was subscribed for a while and all of the patterns were incredibly cute but I often found them piling up because I go through phases of loving to stitch and then not wanting to touch a piece for months. All of the patterns on the site are very cute and kawaii themed with loads of unicorns, food and quotes, seriously I am gushing but The Geeky Stitching Company just makes such lovely kits, I really do recommend them! Oh and if anyone is interested, I listened to Sadie on Audible whilst stitching. Really enjoyed the book but as it is part podcast I really recommend listening to the audio version. It has a full voice cast and the production is fantastic. Have you ever purchased from Geeky Stitching Company? Do you cross stitch at all? If so would love some pattern recommendations to check out! Legendary is the second book in the Caraval series, and if you have read my Caraval review you will know I gave it 10/10, so I went into Legendary with very high expectations, and luckily this book totally exceeded them and is my favourite in the series so far. I don't want to go into plot points too much as this is a sequel and I don't want to give away anything from the first book, but in Legendary we focus on the sister Donatella, who is a lot more feisty and fun than her sister, Scarlett who was the main character in the first book. Tella is quite a flawed character and makes many choices that will have you screaming at the book, but there is something about her that has you rooting for her. The mystery of who Legend is is a lot of fun too. Tella is constantly questioning characters in the book and I love being there and seeing her thought process and trying to figure it out along with her. There is so many twists and turns and with everyone playing the game of Caraval it's hard to know what to believe. Legendary also goes so much further than the game of Caraval though and really works on the world building with the introduction of fates which feel like a mix of mythical Greek gods and tarot cards, two things I love as well as increasing on the politics mentioned in Caraval and it makes the world feel a lot more fleshed out and real. Much like Caraval, the writing of Legendary is beautiful and whimsical which really helps with the magical feel of the story. The descriptions in Legendary are just so lovely it really makes you feel as if you are there and I wish I could actually experience these things for myself. To say I loved Legendary is an understatement. It's just a beautiful magical mystery adventure that I devoured and I really can't wait to see how the story wraps up in Finale which is out this year. If you haven't read Caraval or Legendary yet, seriously, pick them up today! We only have 10 days of February left but I have just this moment decided I want to do a wrap up of what I read in January. I'm thinking I will start doing these monthly because I don't always review what I read so this may be a good quick insight into what I read in a month. Let me know if you enjoy it and now on to the books! My first read of 2019 was a good one! This is all about Greek mythology and follows Circe, the daughter of the titan Helios and her lifetime, from being an odd child who was seen as ugly among gods, to being banished to an island where she discovers she can do withcraft. I really enjoyed this book. Circe is such a strong female character and her (fictional) life was so interesting to follow and was very accurate to Greek mythology. 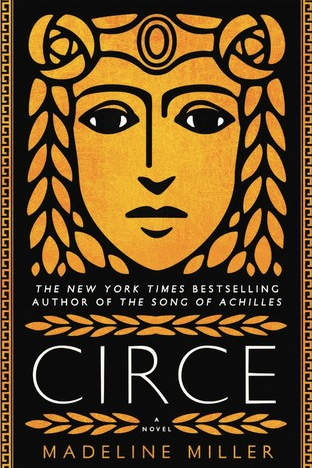 Circe is also beautifully written and I can definitely recommend the audio version too as the narrator was fantastic. 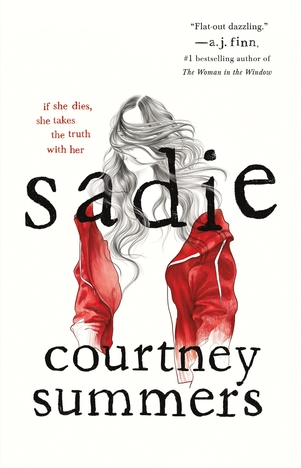 Sadie is another one I listened to the audio version of and I definitely think it's the best way to read Sadie as it's just such a fantastic example of how well audiobooks can work, I think if I had read the physical copy my score would've been a 4/5. The story is told partly as a regular story following Sadie and partly in the format of a podcast that is investigating Sadie's dissapearance, think of the podcast being like Serial. The audiobook version has a full voice cast and it really brings the book to life, it's so clever. As mentioned, Sadie has gone missing. She is on the hunt for her little sisters killer. 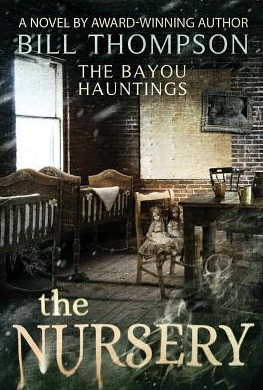 It is every bit as dark and tragic as it sounds and has some very disturbing topics covered, but it's a compelling story and very cleverly crafted. 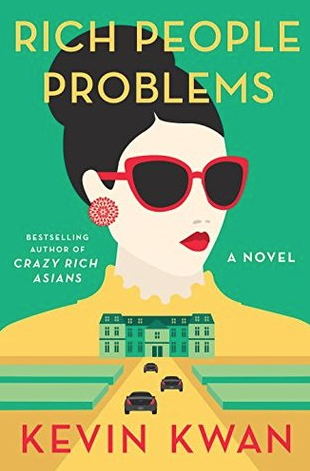 This is the third book in the Crazy Rich Asians series. I recently saw the film so I thought I had to finally get round to reading the third (and I think final) book in the series. Like the previous books this is incredibly fun and addictive read and the descriptions of how expensive and over the top things were still had my jaw dropping which I thought I would be used to by now! Su Yi, who is like Asian royalty is on her death bed and so all of the characters from previous books, and quite a few new ones fly out to Singapore as a last ditch attempt to get in her will and fight over who will receive Tyersall Park, one of the biggest and grandest estates there is. At just 176 pages this was a very short and sweet read. Tsukiko is drinking alone at her local bar when she bumps into one of her old school teachers. After meeting once the pair keep running into each other and this is all about how their relationship develops. 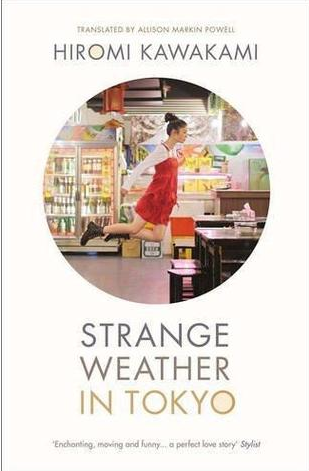 Strange Weather in Tokyo is a very gentle read, there are no huge epic scenes but that doesn't detract from the fact that it is totally lovely but it did make me cry. Thinking back, it was quite a beautiful story. The blurb of the binding talks about how Emmett Farmer is going to be a book binders apprentice, so as you can imagine as a fan of books automatically I was like, YES. The Binding is so much more than this though and the process of binding is actually to remove someones memories and place them in a book which would ensure they don't remember it ever again, but this is a profession that is feared by the poor and abused by the rich. I really enjoyed The Binding. I went in expecting one thing and got something completely different which I really enjoyed, the only part which is questionable to me was the ending as it seemed quite out of character for Emmett. 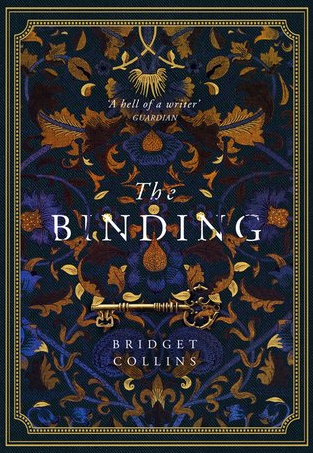 The Binding is a great mix of historical fiction, magical realism, mystery and just a pinch of romance. Very enjoyable. The last book I read this month was one I was really excited for but sadly ended up falling really flat for me. I love a good ghost story and in The Nursery there is a room that has been a locked room that has sat empty for 50 years with a key that can't be found, until the new owners of the house move in and start to poke around, sounds incredible right? Unfortunately I thought this book was poorly written and there were a lot of conveniences in this book that helped wrap everything up neatly. The saving grace is that there a couple of very spine tingly moments that happen, but besides those this is a messy and not too frighting book. I'm actually surprisingly pleased with how much I managed to read in January, definitely a good start to the year which is great because I know February will not be anywhere near as good. Have you read any of these books? Or do any of them peak your interest? Valentine's day is fast approaching us and although it's not something I personally celebrate, I love any reason to do a themed blog post, so here we are with my suggestions of short story collections for Valentine's Day! I've tried not to make this a typical love themed selection though and hoping to cover the bases for everyone. If you haven't heard of a meet cute before, it's essentially where two people are destined to meet and fall in love pretty much instantly. It's soppy, sweet, sometimes a bit sickly but also totally adorable. Meet Cute is full of short stories of this nature by some incredible well known authors like Nicola Yoon, Dhonielle Clayton and Julie Murphy. My personal favourite in this collection was Print Shop, a story set in an old fashioned print shop where everything is still done by hand (romantic setting right there) as the main character is trying to deal with a disgruntled customer on social media. This is a f/f love interest too and honestly, I wish I could've had more of this story. Did I mention this book is super inclusive too? Yep, not just your typical male / female romances here, although it includes them too! This collection is so good for when you want to feel the love. I have been waxing lyrical about Proud since receiving it, but for those of you who haven't heard about it yet, it is a collection of short stories, poems and illustrations about LGBTQ+ characters by fantastic LGBTQ+ authors. There is also a very touching foreword by Juno Dawson who compiled this collection which very nearly had me in tears! So how does this fit in to my valentines post if it's not all about love? Well, love comes in many different forms, not just in a romantic relationship and this book is full of that message, from loving your friends, to the super important message of loving yourself, it's all very heartwarming. And there is a story about penguins too, seriously, who can resist penguins! Not into reading about romance? That's cool. What is the opposite of romance? Horror. OK that might be bit of a reach, but honestly I love horror and I will write about it whenever I can and this collection has some of my absolute fave authors in it, including Leigh Bardugo, Jay Kristoff and Marie Lu! As this is a YA selection it's not super full on so great for those new to the genre, but some tales are definitely more chilling than others and ranges from more realistic thrillers that will leave you checking your bedroom windows, to horror with creatures that go bump in the night. So quite a short wrap up of short stories, but Valentine's day is only one day! I have no idea what I am trying to say anymore other than I thoroughly love all of these collections and you should read them regardless or not of if it's Valentine's day. Do you have any short story collections you would recommend? And hope you all have a lovely Valentine's day! Fierce Fragile Hearts is the stunning companion novel to Sara Barnard's YA bestseller Beautiful Broken Things. It is about leaving the past behind, the friends who form your future, and learning to find love, in all its forms. I have been a bit sceptical recently when it has come to YA contemporary's as I have found them to be quite hard to relate to, so I was weary of Fierce Fragile Hearts, but I absolutely loved it and it was emotional on so many levels . I even had to stop reading this whilst on the train to avoid crying on my way to work. FFH is a companion novel to Beautiful Broken Things, it follows Suzanne who was a friend in the first book a few years on. FFH is a great book within it's own rights, and you don't have to have read BBT in order to understand the story at all, although I am grateful I have because the character progression is so well done. Sara Barnard writes teenage voices so well, they are completely realistic and as someone who didn't go to university, I found Suzanne quite relatable with the feelings she has in this book towards her friends and how the friendships change as they grow older and experience different things. As Suzanne is someone who has been in and of care, this is her first time being on her own and we get to see the ups and downs of someone not just dealing with being on their own for the first time but also the road to recovery and how it is often quite bumpy. Overall I loved this book, in particular the ending. As I've mentioned I went through all the emotions reading this and I just love that this isn't a dramatic fantasy story, it feels more like a slice of life and is incredibly realistic. This was a joy to read and quite different from anything I have read recently. Definitely recommend. 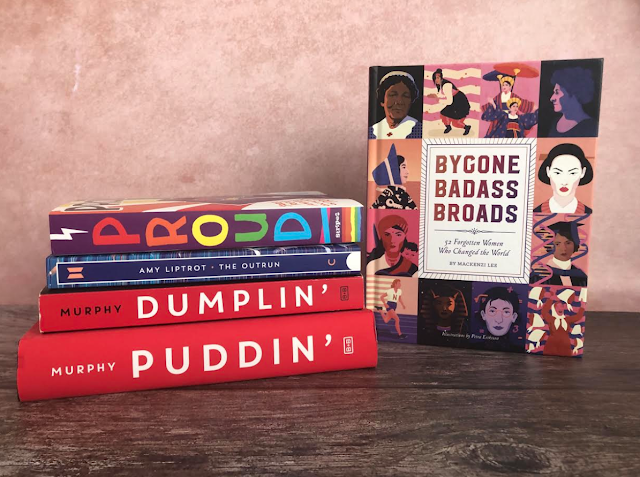 Bygone Badass Broads, 52 Forgotten Women Who Changed the World - It's no secret I am a fan of these types of feminist books so when I received this as a Christmas gift from my best friend I was super excited. This is a gorgeous book of illustrations and descriptions of women in history who have had a vital role in pioneering the way forward for other women but are lesser known today. It's fantastic and definitely one I am picking up for my younger cousins to read too. Proud - This is a book that I am so fricking excited about and I seriously hope everyone picks up. It's a collection of short stories, poems and illustrations that have an LBTQ+ theme and are all by LGBTQ+ authors. 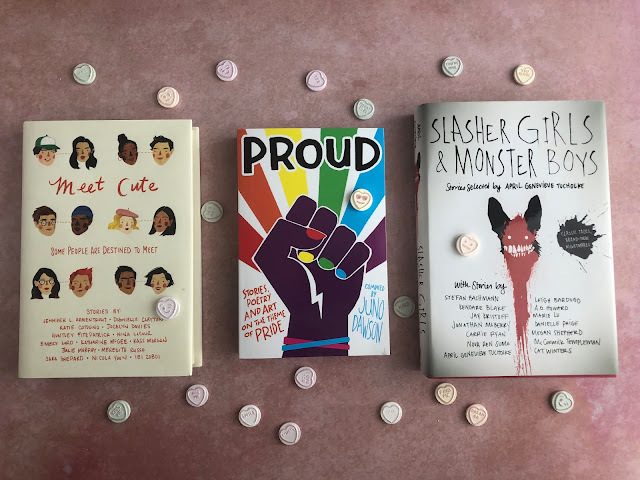 Proud was compiled by Juno Dawson who is a fantastic author and this is such a wonderful celebration of the LGBTQ+ community. The Outrun by Amy Liptrot - I received this book in the January Reading in Heels subscription box. The Outrun is actually is a memoir as Amy is trying to overcome addiction after she moves back to Orkney after living a heady lifestyle in London. This has stellar reviews and looks like it will be quite an emotional read. Dumplin' & Puddin' by Julie Murphy - Like many people who use twitter, I watched Dumplin on Netflix and absolutely fell in love. It's just such a charming feel good film so of course I had to pick up the book straight away, and getting the sequel was pretty much a no brainer. That is it for this month. Have you watched Dumplin' yet? Did you enjoy it as much as I did? It seems like Netflix is really killing it with the book to film adaptations at the moment.